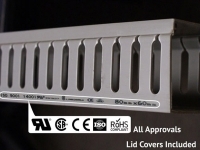 Wiring ducts are an important and effective necessity in any home, work or industrial space. While protecting wires from external forces, wire ducts and troughs also neatly bundle cables for a clean and organized environment. 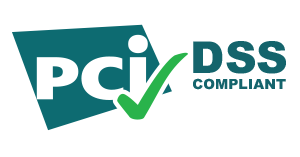 They provide a unique and professional solution for cabinets and control panels, varying in size and material to meet an array of prerequisites. Whether you need to organize wires in a home office or keep a factory's cables in order, wiring and cable ducts are the most practical and efficient answer. What sort of wiring duct will I need? This really depends on where you will need the wiring duct and what sort of wires or cables you have. 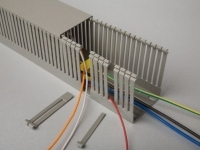 Wire and cable ducts can be manufactured in PVC or Noryl material, and can be structured as open slot, narrow slot, closed slot and solid wall. Which wiring duct structure should I be purchasing? 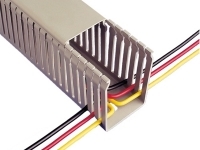 An open slot wire duct contains wider and roomier spaces for cables to slide through. They are most effective to use when dealing with thicker wires or when you require easier access for pulling and routing cables. 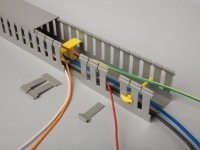 With a slide-on lid cover and removable fingers, this is a very customizable structure that allows you to increase space to suit your wire trough needs. A narrow slot wire duct holds a similar structure but has narrower spaces meant for tighter holds on wires and cables. They are most effective to use when you need to organize a large amount of wires, thus requiring more access points. It also provides a clean and streamlined appearance because of the structured holds on the cables. Like the open slot wire ducts, they provide removable fingers for further convenience. A closed slot wire duct resembles open and narrow slot wire ducts almost exactly with the exception of the removable fingers. 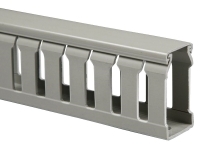 With a more rigid sidewall structure, the closed slot wire ducts give strong cable retention and support. 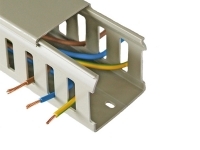 Finally, a solid wall wire duct does not contain sidewall slots and thus provides complete cable and wire protection. This sort of structure is most effective for when you do not require side access or break outs for your wires and cables. Which material should I choose for my cabling duct: PVC or Noryl? Again, this depends on your situation. The main difference between PVC and Noryl is that Noryl is flame retardant, making it an effective choice in environments where fire and flame spread are legitimate safety hazards. Will you be using the cabling duct in an environment that involves fire? Is flame spread a serious concern? If so, it is highly recommended that you play it safe and invest in a Noryl cable trough. Is there anything else I might need when purchasing wiring ducts? 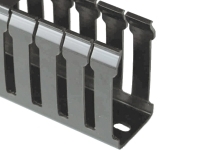 You may want to look into purchasing accessories for your wiring duct for further customization, like wire duct cutters. 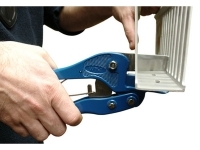 With a compact and convenient design, wire duct cutters provide users the opportunity to modify their wire ducts to fit any size wire perfectly. 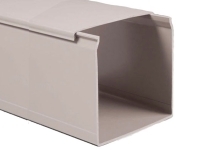 They are lightweight and extremely user friendly, so don't feel shy about purchasing them along with your desired cable ducts!